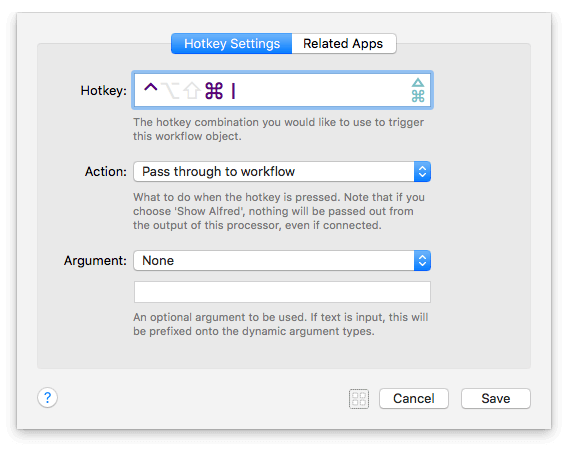 One of the easiest workflow types you can create is a hotkey-triggered one; With a quick hotkey, you can launch an application or file in an instant. What can I use hotkeys for? In this tutorial, I'll create a simple hotkey workflow to launch a few of the applications I use many times a day. 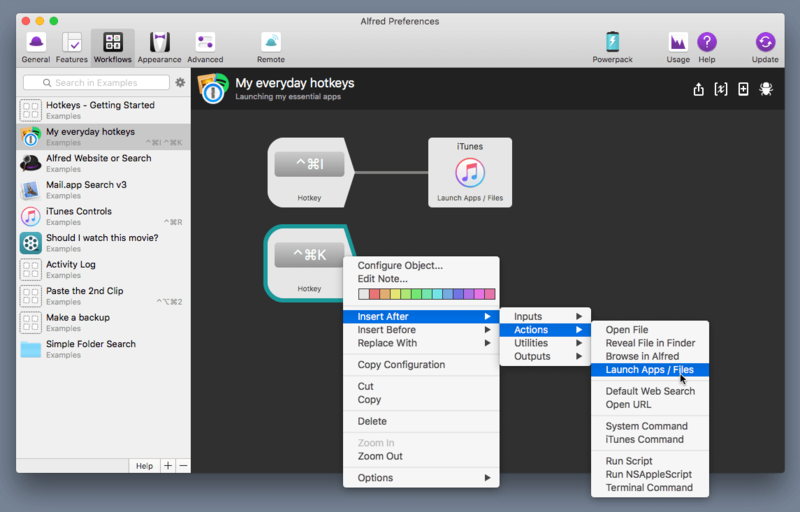 Launch Alfred's preferences to the Workflows tab. Click the + button in the bottom left of the preferences and select Templates > Files & Apps > Launch file group from hotkey. When the "Details" tab slides down, give your workflow a name and a bundle ID, which uniquely identifies the workflow. Optionally, you can also drag an icon to the well in the top right. Double-click the "Hotkey" object and type in the hotkey you want to use. Click "Save" to close. For more details on the Action and Argument settings in this preference pane, and on using Related Apps, see the Hotkey Triggers page. Next, double-click on the object to the right, the "Launch Apps/Files" object. Drop the application, folder or file you'd like to launch with your hotkey. In this case, I've searched for iTunes using Alfred and dragged it directly from Alfred's search results to the dropdown. Click "Save" once you've added the applications or files you want to launch. 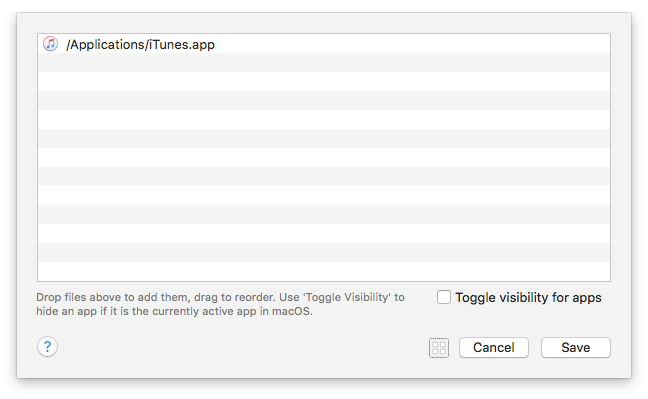 You can select multiple applications or files to launch at once. For example, if you're editing photos, you may want Photos, Aperture and Safari launched at once, in which case you would simply drag all three to this window. I now have a single hotkey launching a single application, so I could stop here. However, I'd like to add more applications and hotkeys to this particular workflow. You can add as many of these hotkeys as you need for your most common applications and files, or you can connect the hotkeys to various other actions. 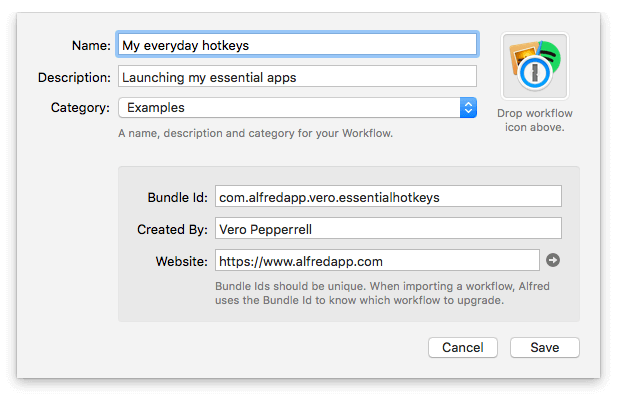 Your workflow is now ready to use; Press the hotkey combination you've set to launch the apps/files. Instant productivity boost! 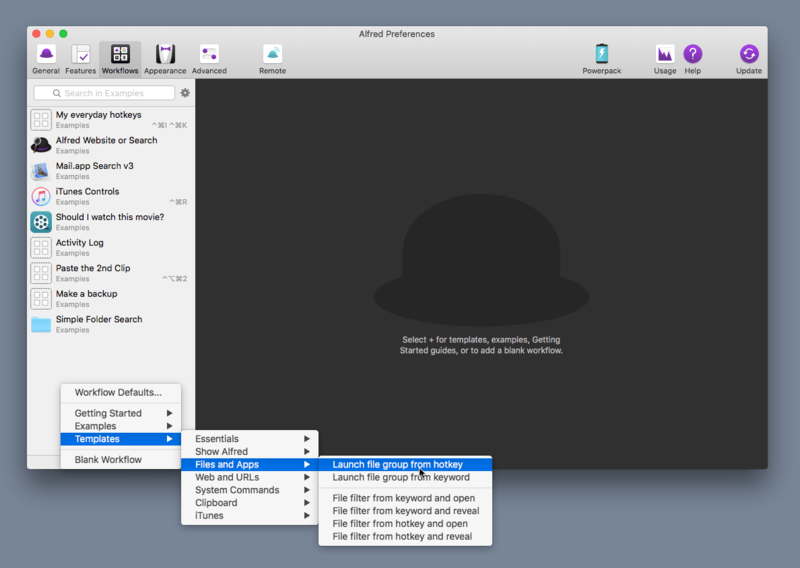 Take a look at the Guides and Tutorials page for more great tips on using Alfred.